Tensuke Tempura: Right On Time! When my wife makes tempura, I sneak to her side. When no one is looking I make sure to get the first bite. Plucked from the wok, blazingly hot, that first piece is so light and so airy it may as well float. It is the ideal way to enjoy tempura — in the very seconds after it has been cooked. Unfortunately, when you eat tempura at home, as a family, you have to be patient. You have to wait. No matter how skillful my wife’s cooking is, no matter how kind she is as she stays at the wok and sends a plate of tempura shrimp to the table, that first bite is always the best. What is ideal for life-happiness (family) is not ideal for tempura eating. The same is true for any other restaurant, izakaya, noodle shop that serves tempura. Seconds count and restaurants have to plate, have to wait for those noodles to cook and have to carry the dishes out to your table. Tick Tock. Tick Tock. 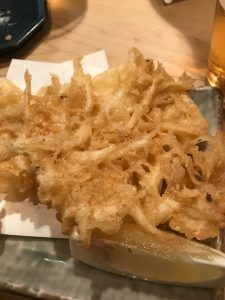 The only way to enjoy a meal of tempura served at that ideal moment (other than cooking it for yourself one piece at a time) is to go to a tempura restaurant and sit at the counter. There, like sushi, you are served each piece as it is cooked. I first experienced such a restaurant 14 years ago, when I was getting married in Tokyo. It was tiny spot in Ikebukaro, maybe 8 stools at a counter and one V E R Y old chef. His timing, his moves were impeccable – a product of pure muscle memory. He betrayed no joy. No sadness. He just served us one piece after another of precision tempura — piping hot, grease-free with incredible ingredients. I am sure he has since passed away as his restaurant is no longer there. I have no doubt that Instagram is now far more influential than all the myriad restaurant reviews (print, blog, Yelp, social media) combined. On the one hand, I loathe how this has given rise to the concept of “insta-friendly” food ( purple ice creams, over-loaded milkshakes, etc.) developed for visual impact above all else; on the other hand, I have discovered a lot of killer restaurants as I trust my friends and my eyes more than some anonymous Yelp reviewer. So it was that a tempting photo of shrimp tempura led me to Tensuke Tempura in Koenji. 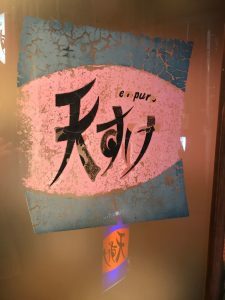 Tensuke Tempura is nestled in a small arcade alongside a few tiny izakaya (including a heavy metal “rock” bar) and a stylish teppanyaki restaurant. Koenji is famous for inexpensive food and cheap(ish) rents. It is packed with restaurants, clothing stores and bars — all of them, seemingly, busy. Covered shotengai extend east and west to Asagaya and Nakano — making the neighborhood a great place to walk, eat and explore day or night. Tensuke is famous and small, so there is always a line. My 2 friends and l endured the hour-long wait until we were seated at the 10-stool counter. The chef (and I suspect owner) is a pro and a show-man. 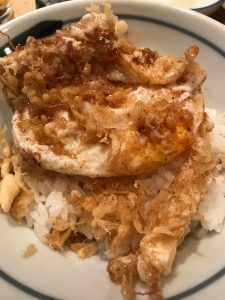 His signature is a tempura egg served over rice: he cracks the egg into the bubbling oil, no-looks the shell over his shoulder into the sink. He dramatically swirls tempura batter into the egg, gives a clap and raises his hands up in a kind of “zetz!” move. Pure Vegas. Like a Yorkshire Pudding, the hot oil and batter makes the egg puff up, the edges crunchy and the yolk perfectly soft and flavorful. Good things follow. Shrimp, tiny white-bait, fish, squid, asparagus, eggplant, green pepper, mixed seafood with baby shrimp and much more. Suggestions are made for each piece whether to season with salt or dip into tentsuyu sauce with grated daikon. 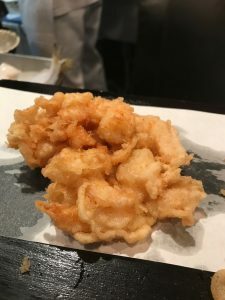 The ingredient quality is high, the oil clean, the tempura batter a proprietary blend; there is serious timing going on, a virtual ballet between the chef and his assistant to get that tempura in your mouth as fast as possible. The chef apologized for not having the shirako (the sperm sack of a codfish, sounds gross, but is delicious) I requested but made a tempura with monkfish liver. It was absolutely unique and unlike any preparation of monkfish I have ever had — lighter, more delicate, subtler in flavor. 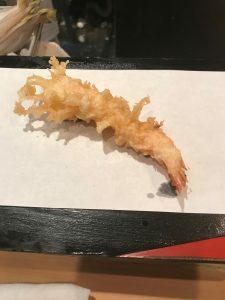 In fact, everything benefitted from the chef’s light touch and years of experience creating a profound balance between the texture of the tempura and the elemental flavors of the ingredient encased. Like the best Japanese food, tempura as served at Tensuke is a gustatory science based on repetition, skill and love. It is also very very inexpensive as opposed to many of the great Tokyo tempura places that rival only expensive sushi in price. Thank God for the Portuguese who introduced tempura to Japan. I am forever grateful.